Nurfaezah is from cohort 7 of the TNTA programme and is currently sailing with Pacific International Lines (PIL) Pte Ltd. 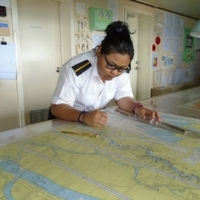 The Captain’s reply of “So?” changed Nurfaezah’s life, and perspective on seafaring. After some extensive research, she made the career switch from bartending to maritime. Two years into the programme, Nurfaezah could not have imagined how far she has come, as she stood before a crowd of PIL officers and staff to make a speech at the company dinner. Having completed her 18 months of sailing experience with PIL, she is into her final phase of the TNTA programme. Seafaring is not just for the men! Despite the challenging life of a seafarer as a female, Nurfaezah has not regretted this bold decision that she made 2 years ago. Nurfaezah gives credit to Wavelink Maritime Institute for thinking through the structure of the TNTA programme which included practical aspects during the pre-sea training, such as simulator training at the state-of-the-art Wavelink Maritime Simulation Centre. This gave her the confidence to steer an actual ship when given the opportunity. Her 18 months sea experience helped her acquire the skills and knowledge working onboard.